Expert advice on making sound investments in frontier marketsColombia, Indonesia, Vietnam, Egypt, Turkey, and South Africa (CIVETS) are six countries poised to be the next group of developing nations to see an economic boom. These countries, similar to the BRIC (Brazil, Russia, India, and China) are currently reaping the rewards of a growing economy. Frontier Markets For Dummies provides an honest look at the CIVETS countries and explores ways that savvy investors can prepare to take advantage of the emerging economies. You’ll get the lowdown on the basics of frontier market investing, how to weigh the potential with the challenges and risks, factors that affect investments, and much more. 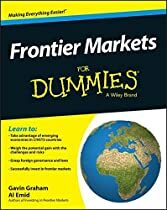 Frontier Markets For Dummies provides investors at all levels with the information they need to take advantage of the latest group of emerging markets.